DALLAS -- The head of the company building the Dakota Access oil pipeline said Friday that it won’t be rerouted but that he’d like to meet with the head of an American Indian tribe to try to ease the tribe’s concerns about the project. Kelcy Warren, the CEO of Dallas-based Energy Transfer Partners, told The Associated Press that the company has no alternative than to stick to its plan for the $3.8 billion pipeline, which would ship oil from North Dakota to Illinois and which is nearly completed. “There’s not another way. We’re building at that location,” Warren said. Warren said he would welcome the chance to meet with Dave Archambault, the chairman of the Standing Rock Sioux, to address the tribe’s concerns that the pipeline skirting its reservation would endanger drinking water and cultural sites. Archambault, who was with celebrity sympathizers who toured the tribe’s protest encampment Friday, including the actors Shailene Woodley and Ezra Miller, said he’d be willing to meet with Warren but that he doesn’t think it would make a difference. The 1,200-mile, four-state pipeline is largely complete except for a section that would pump oil under Lake Oahe, a Missouri River reservoir in southern North Dakota. The Standing Rock tribe fears that a leak could contaminate the drinking water on its nearby reservation and says the project also threatens sacred sites, which Warren disputes. 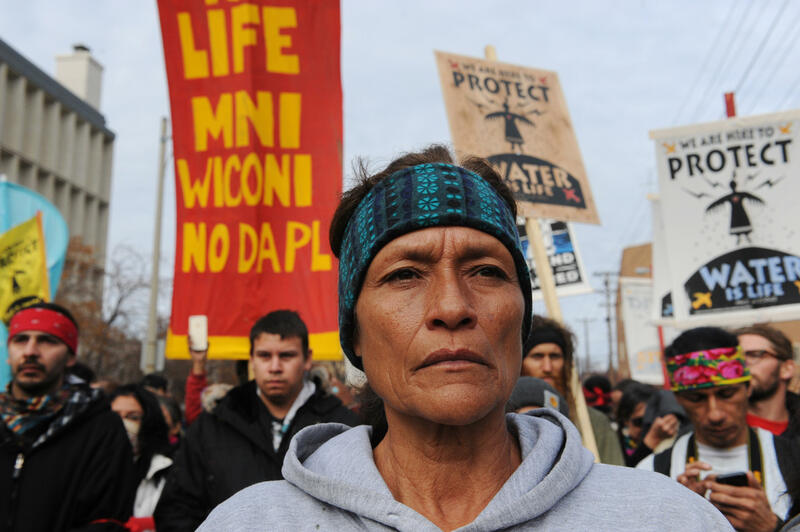 President Barack Obama earlier this month raised the possibility of rerouting the pipeline, and Archambault has told the AP that would be acceptable to the tribe as long as the new route wouldn’t take it near the reservation. Warren noted that the Dakota Access route parallels the existing Northern Border Pipeline, which crosses the Dakotas as it carries natural gas from Canada and the U.S. to the Chicago area. “We’re going to cross the river at that location,” he said, calling it the “least impactful” site. The Army Corps of Engineers in July granted ETP the permits needed for the crossing, but the agency decided in September that further analysis was warranted given the tribe’s concerns. On Monday, the Corps called for even more study and tribal input. ETP responded the next day by asking U.S. District Judge James Boasberg to declare that it has the right to lay pipe under Lake Oahe. The judge isn’t likely to issue a decision until January, at the earliest. The matter might linger until after President-Elect Donald Trump takes office. Trump, who owns stock in ETP, has said he wants to rebuild energy infrastructure. In the meantime, the months of protests against the pipeline continue. There have been demonstrations at the protest encampment near the site of the proposed reservoir crossing and elsewhere, including at the state Capitol and state-owned Bank of North Dakota. About 500 people have been arrested, in total. Protester Kendrick Eagle, who was with the actors on Friday, said he was part of a group that met with Obama when the president visited the reservation in June 2014 and that Obama promised to stand with the tribe. “Now is the time. We need him more than ever for this pipeline,” Eagle said. Warren called protests that became violent “repulsive,” but he also said the company could have done some things differently.